The image I’m going to post you may find distressing so DON’T LOOK ON IF YOU DON’T WANT TO. You have been warned. Ever wandered why babies cry, dribble, refuse to sleep etc when they start teething? Well there’s a picture below to show the skull/jawline of a baby. It’s a distressing image for some and to be honest it makes me feel a bit sick when I look at it. It’s only when you see it though that it all makes sense and you are reminded that babies are born with their teeth and then they grow out. All baby teeth are developed in utero (for example the budding stage starts at 6 weeks of pregnancy) and then it seems the adult teeth are ‘finished off’ a little later, but they are still present. All crammed in a baby’s mouth/jaw they will have 20 baby teeth and 32 permanent teeth. The process of teething is actually called ‘tooth eruption‘ (which says a lot) and it has three stages: The first, known as deciduous dentition stage, occurs when only primary teeth are visible. 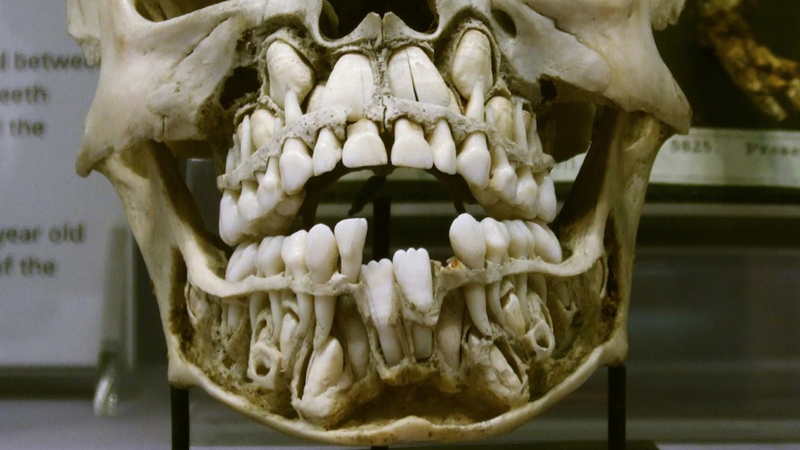 (2nd) Once the first permanent tooth erupts into the mouth, the teeth are in the mixed (or transitional) dentition. (3rd) After the last primary tooth falls out of the mouth—a process known as exfoliation—the teeth are in the permanent dentition. This entry was posted in Health, newborn development, Oral Care and tagged Deciduous teeth, Dental caries, Infant, Permanent teeth, teething, Tooth, Tooth eruption. Bookmark the permalink.